Fleeing persecution at the hands of Roman authorities, the Holy Family takes refuge in Egypt. Joseph dozes beside a dying campfire while his donkey grazes on sparse desert grass. At left sleep the Virgin Mary and infant Christ, crowned with a halo of light. 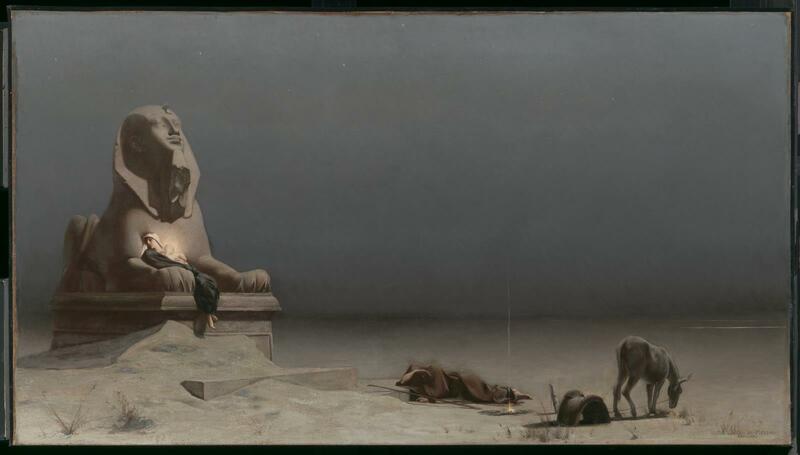 They lie in the arms of a sphinx, its eyes turned to the heavens, where the first stars begin to appear. A successful Academic artist, Merson never traveled to North Africa, but his use of archeological detail creates the illusion of an eyewitness account, breathing new life into a time-honored subject.